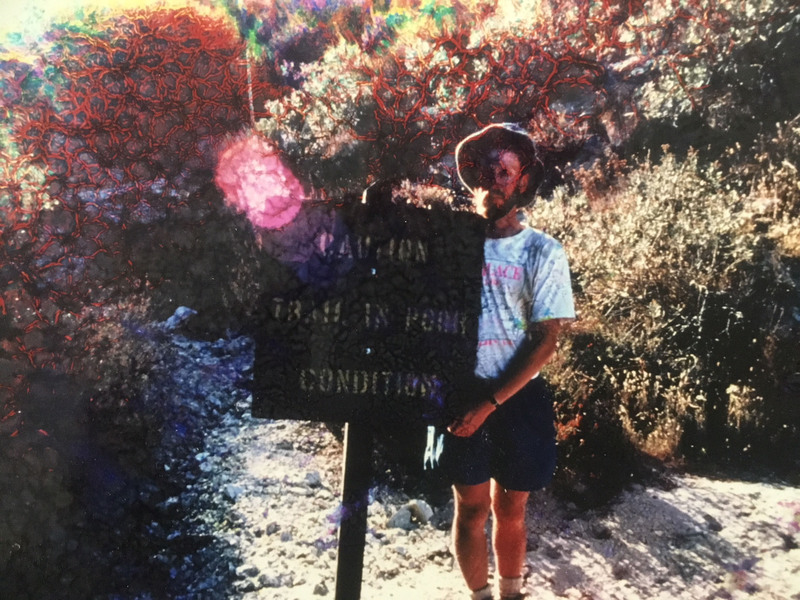 I just found this vintage, water and sun-damaged picture taken of me on the Pacific Crest Trail. The lettering on the sign is almost illegible, but it says CAUTION: TRAIL IN POOR CONDITION. You can’t tell from the photo but the sign itself is in horrible condition. Though it looks like I am posing with my arms around the warning sign, I’m actually holding it up. When I came across it, the thing was lying on the ground. Anyway, I thought this was worth posting because I just realized that my first effort, The Cactus Eaters: How I Lost My Mind And Almost Found Myself on The Pacific Crest Trail, came out 10 years ago. Unless my memory is letting me down, I believe this photo was taken on the trail a few miles north of Tehachapi, on the same stretch of the trail where I stupidly dumped out my water to save pack weight. Ugh! My callow younger self was not very bright, sad to say. The loss of that water led to the horrible, tongue-piercing incident that inspired the book’s title.